The dreams and realizations of the Sapphire Consulting Services Company are getting bigger and bolder every year. This includes our website. The new website is interactive and gives better access to About Us, Company Overview, Services, Technology, Software Development, Mobile development, Outsourcing, Blog, Careers, Contact and Portfolio, It is also fully responsive with mobile devices, making it easy to navigate on a wide range of web browsers and portable devices. Our goal with this new website is to provide our visitors and clients an easier way to learn about Sapphire’s services and solutions and also to allow them to browse information based on their own choice. We’ve also improved the structure, so you’ll find more easily what you are looking for. 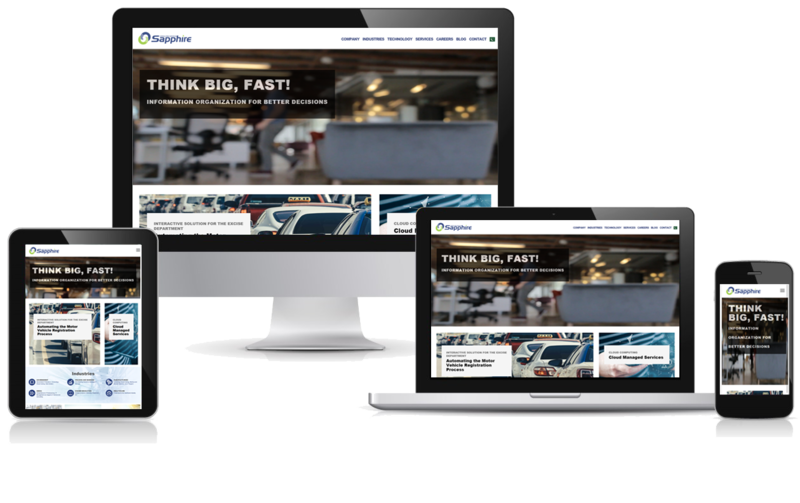 There’s a whole host of smaller but important changes, all to make your experience of the Sapphire Company website that much better for you. The technical architecture has also been improved, to integrate it with our existing processes and systems and enabling the possibility to add new features more easily in the future. The new website was built in-house, proudly handled by Web Development Wing. We hope you enjoy our website! For any questions, suggestions, feedback or comments, please email us at info@sapphire.co.